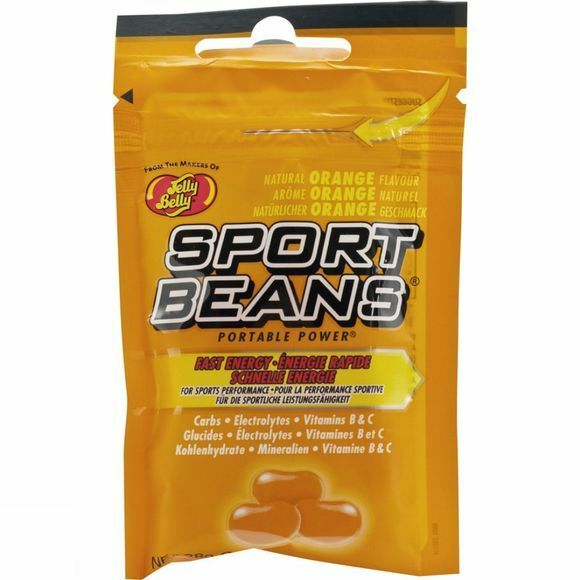 Jelly Belly Sports Beans are specifically formulated for supplementing performance in sports. They provide simple carbohydrates for fuel and electrolytes, such as sodium, potassium, vitamins B1, B2, B3 and C, to aid energy metabolism and all-round optimal health. Evaporated cane juice, glucose syrup, acidity regulators (E325, E330, E331, E332), gelling agent (E440), orange puree, salt, glazing agents (E901, E903, E904), colour (carrot), flavourings, ascorbic acid (Vitamin C), niacinamide (vitamin B3), thiamine hydrochloride (vitamin B1), riboflavin (vitamin B2).